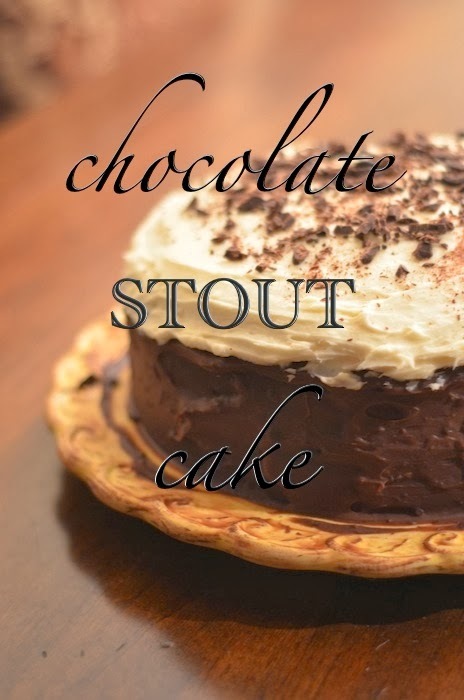 Earlier this month I came across a recipe for a Chocolate Stout Cake in Coastal Living. Shocking, I know. Their October edition had a whole slew of recipes for cooking with beer. Since JD and I have been into brewing our own beers lately, I thought this cake would be perfect for his birthday. I showed him the picture and recipe and that was the end of it. This cake was being made regardless of an occasion. The recipe called for three layers in 8" pans, but since I only had two 9" pans, I decided on two, and good thing because the cake ended up being very tall, and heavy, and rich. My stomach hurts just thinking about having a third layer on top. It would definitely be too much. Beat the butter at medium speed with an electric mixer until creamy, then gradually add the sugars. Add eggs, one at a time, beating until blended after each addition and stir in the vanilla. Combine the flour and next five ingredients and add to butter mixture alternately with the beer. Once mixed, pour the batter into either three greased eight inch pans or two nine inch pans and bake for 25 to 28 minutes. Cool in the pans for about ten minutes and then remove and let them cool completely on wire racks (a plate will work just fine if you don't have wire racks). Spread the chocolate ganache frosting between the layers of the cake, as well as on top and on the sides. Spread cream cheese frosting on top and garnish with shaved chocolate if you like, and enjoy! Heat cream in a saucepan over medium-low heat. Remove from heat and add chocolate, stirring until smooth. Stir in the vanilla and refrigerate for two to three hours or until firm. In an electric mixer, beat cream cheese and butter until creamy. Gradually beat in powdered sugar at low speed until blended. Beat in vanilla. Beat at high speed until light and fluffy. This recipe will make about two cups. oh my gosh that looks so good! need to go get a spoon full of nutella so satisfy what this picture just did to me! OMG. This looks amazing. I have to make this for my sister, I think she would LOVE it.